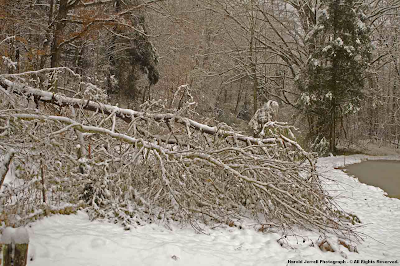 "Pops, cracks & thunderous crashes began to fill the evening hours as tree limbs and whole trees gave way under the increasing weight of a super-wet snowfall. Flashes of blue, pink, and green light filled the sky as large snowflakes fell with fury. While some of the colorful light display was attributed to power lines being ripped from electrical transformers, some of it was also the result of lightning as convection ( thunder ) erupted within the potent upward vertical motion field. white light into its component colors. Wayne Browning - January 1998.
of the Appalachians during January 27-28 in 1998. 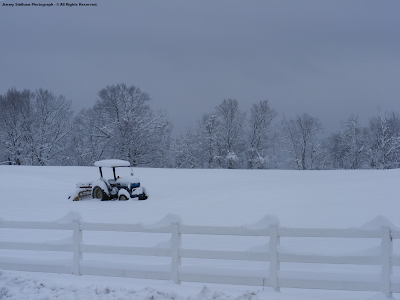 That storm unofficially established a new 24-hour snowfall record for the state of Virginia, when 36" to 40"+ of snow depth buried upper elevations of the sprawling High Knob Massif ( Wise-Scott counties ) and adjacent portions of the Tennessee Valley Divide ( southern Dickenson County ). across Wise and Dickenson counties. ( 45+ years of records ). Above 1800 to 2000 feet in elevation the snowfall became less dense, with a significant decrease in snow densities observed above the 2500 to 3000 foot elevation zone. ( with only a few mid-elevation exceptions ). the atmospheric setting during January 27-28 in 1998. 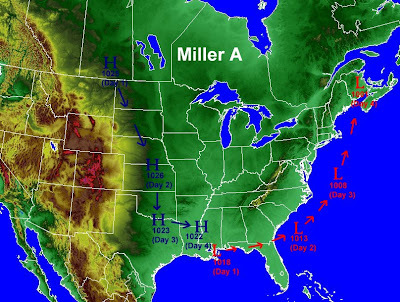 The January 1998 storm took an inland track of a Miller A Cyclone, as typified below by a graphic courtesy of the Blacksburg, Va., NWSFO. Fast forward nearly 11 years to December 16-17 in 2009. No one outside of the hardest hit corridor from northern Scott, across Wise, Dickenson, and Buchanan counties realized the scope of this disaster nor its true impact upon residents. That included the regional news media. of this absolutely incredible MEGA-disaster. 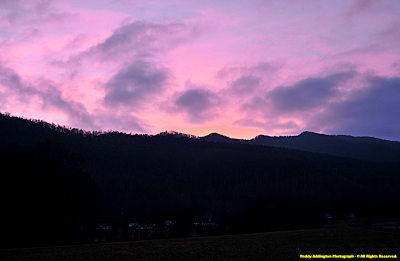 The dawn of December 16 was amid a colder air mass in the wake of another wet, wind driven rain across upper elevations of the High Knob Massif. By contrast, only 0.52" accumulated in Clintwood on strong downsloping SSE-SE flow into northern Wise and Dickenson counties ( pushing the December 1-15 tally to 3.15" ). NOT reveal anything dramatic in the current state. a cold, dry ( as illustrated by the lower right chart ) air mass. Of note, however, is the upper right chart which shows a distinct split flow in the upper air, with a polar jet stream extending from the Pacific Northwest across the Great Lakes and a sub-tropical jet stream running from Texas into the Carolina's. The situation in the forecast model world was, however, showing a MUCH different setting for coming days, with models printing out some impressive precipitation numbers across the southern Appalachians. In fact, the setup on paper was analogous in important ways to the great January 1998 snow blitz which I highlighted above ( with a deep isothermal layer showing up in lower levels ). and sent out a mass email to my climate newsletter mailing list around 11:30 PM on December 16 to draw attention to the fact that a significant winter storm was taking shape on forecast models. The current state of the atmosphere above, at 7 AM on December 17, shows increasing Gulf of Mexico moisture as high pressure sat on top the Appalachians. ( i.e., cyclogenesis and subsequent destruction ). By 7 PM on December 17, as illustrated on the charts above, a defined surface to 850 mb low pressure had closed off over the western Gulf of Mexico ( far E to NE of Brownsville, Texas ). to also last for approximately 5 days ]. another situation like January 1998. However, after 13 days without power, I felt it necessary to apologize to my mailing list that I did not send EVERYONE on it a much stronger warning ( even though that is NOT in any way my job or responsibility ). [You will likely never hear ( how nice it would be to hear ) broadcast news media and official forecasters apologize for a forecast in error, or presented without a strong enough warning of impending danger]. life-death situations involved, I cut NO ONE with significant weather knowledge any slack on this one! They were ALL DEAD WRONG and NEVER HAD A CLUE as to the real and true magnitude of this event upon its unfolding ( and DANGER to everyone impacted ). That no slack cutting also includes myself, since I should have sent out a stronger warning and discussed it with those folks responsible for forecasting across this region in the days prior to the event ( reminding everyone of the January 1998 storm ). Thus, the apology to those on my climatology mailing list! It is well understood that any given storm or event can be under-forecasted in terms of impact, but once it unfolds itself before the eyes, and reveals its life-threatening nature, some very STRONG and AGGRESSIVE action must then be taken immediately in every way possible. Some might think such an event could not be anticipated by anyone. That is simply NOT TRUE, since climatology teaches! to this storm. It was the teacher. If it happened then, it could happen again and be WORSE. An event more destructive than what will be shown below CAN occur, but will never be highlighted strong enough in advance IF lessons are not learned. Important changes were evident on weather charts by 7 AM on December 18, with a deepening surface to 850 mb low pressure along the northern Gulf of Mexico coastline, and a rapidly growing moisture field being lifted into the RIGHT-REAR quadrant of a phasing jet stream. Note wind vectors in the upper right panel pointing into higher wind speeds, above a deepening moisture field shown in the lower right chart ( above ). The simple effect would be like pulling air upward through a chimney, as northern and sub-tropical jet streams phased, or merged together, generating a divergent wind field aloft that had to be compensated for by converging air flows at the surface ( i.e., a winter storm was literally beginning to form right over the southern Appalachians ). Air above the surface, at the 850 mb level on the upper left chart, was above freezing ( 0 degrees Celsius ) but also relatively dry so that evaporative cooling would occur with precipitation onset. A key feature of this event was E-ESE winds forecasted above 3000 feet, with E-NE winds across lower and middle elevations. These ingredients generated an unknown. How much precipitation would fall as rain across lower elevations before a change to wet snow? All snow was NEVER in question for mid-upper elevations along windward facing slopes of the High Knob Massif and Tennessee Valley Divide, where upslope cooling rules. In fact, I expected this event to set the stage for a Thermally Indirect Mesoscale Circulation that is orographically forced and held in place on easterly air flow trajectories by the sprawling expanse of the High Knob Massif, which I first identified post-January 1998. [ I discovered it during events following the January 1998 blitz, and upon its discovery realized that the circulation had played a critical role in enhancing that state record shattering fall of snow ]. So I was both worried ( about a WET crippling snowfall ) and also excited about getting another opportunity to study and document this unique High Knob Massif circulation! 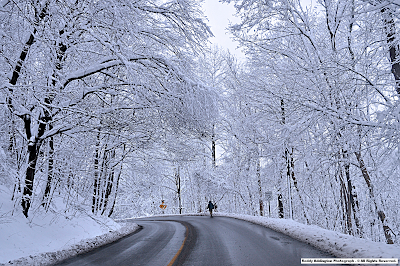 The first snowflakes began falling atop the High Knob Massif between 1100 and 1200 hours on December 18, rapidly turning the ground and road white on strong easterly winds. Increasingly large snowflakes were noted, with drifting along the crestlines beginning surprisingly fast on horizontally driven snow. At the same time, rain was falling leeward of the highcountry on the floor of Powell Valley. It soon became very evident that the massif was generating an orographically forced melting zone, and IT WAS ON, as snow drifts of 6-12"+ developed in only a couple of hours! Light rain initially began falling at Clintwood 1 W ( 1560 feet elevation ), amid the Russell Fork Basin of Dickenson County, with 0.17 inches of accumulation before a change to wet snow. Of particular interest, the snow was extremely slick. My Dad and I went to Browning Farm during the time rain was mixing with and changing to wet snow. 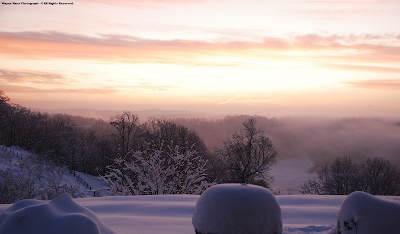 It was all snow by the time we got up on the farm ( at 1700-1800 feet elevation ). Black Beauty, putting out extra hay to last for at least five days. By departure time for home, snow had only accumulated around 0.3 inches on the ground and road. My Dad was taking the tractor, with snow blade to the house, in our anticipation of future snow plow work. He dropped the tractor blade to "back-blade" the road down to the house. This loosened up gravels and brought some to the surface. This helped me, since every time I tapped the brakes of our F-150 4x4 truck it would slide. I knew right then, it was going to be one SLICK snow! Snow quickly accumulated, with very LARGE snowflakes forming amid the isothermal profile of the lower atmosphere ( deep layer in the vertical with near freezing air ). By 1700 hours ( 5 PM ) a rain gage melted content found 0.40" to nearly match a 0.41" snow core taken off my snowboard. 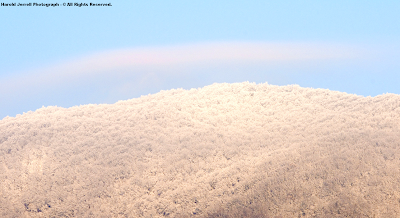 Snow was falling nearly straight down into the mountain hollow, in rather dramatic contrast to the horizontal fall observed on lofty Eagle Knob of High Knob ( 4196 feet elevation ). ( it would get higher ). Snowflakes became absolutely HUGE, with measurements on some flakes finding diameters of 2" to 4"+ . In fact, the largest clumps would cover the entire palm of your hand and splash over the sides! 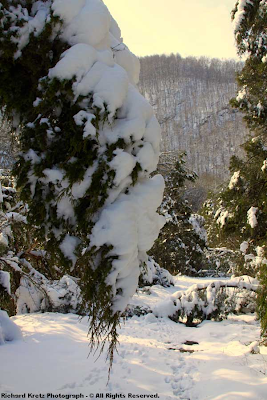 Cal Adams said snowflakes were like tea cup saucers falling from the heavens at his home on Little Mountain of High Knob, amid the upper Devil Fork Basin of the Clinch River Basin. Photographer Roddy Addington confirmed it, as he left his construction site upon the floor of Powell Valley amid only rain and got up to near Little Stone Mountain Gap on U.S. 23 .
so big as they would sag downward in the middle. Like grapefruits falling from the sky! Others also said they had never seen anything like them, but such snowflakes ( to at least near these sizes ) were also an ominous characteristic of the January 1998 storm. At that point, I simply felt a gut wrenching sickness in my stomach as I simply knew what was coming, and NO ONE could stop it! It was at about this point, with 4" of ground depth, that I started to hear pops and cracks of breaking tree limbs. A sound unlike any you've ever heard, for anyone never having been through it, and a feeling that can not really be described. [ During the January 1998 storm I began to hear pops and cracks with only 2" of ground depth, indicating that this snowfall was not quite as WET and dense as the 1998 fall since it took 4" of depth to begin the horror this time. It should be noted that while pops, cracks, and crashes associated with an ice storm can also be very dramatic, they generally come on slower as it takes more time for ice to build up than snow ]. 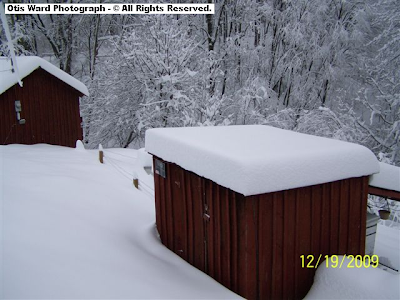 Joe Fields reported more than 8" of snow depth in the High Chaparral community of High Knob ( elevation 3300 feet ) at about this same time of 1700 hours on December 18. Joe also reported that electricity was already out ( an ominous early warning to all )! Nearly 1000 vertical feet higher, and 3.7 air miles west on Eagle Knob of High Knob, the snow looked to be much deeper. [ Note the large inverted V-shaped mound of snow on back of the cream colored building, and drifting around the thick cement tower support on the ground ]. An earlier image for comparison. [ Easterly winds were blowing from left to right across these images, so its very interesting how the large mound of snow built up on the backside ( leeside ) of the building. No doubt due to some vortical motions ( air swirling around the building ) ]. Meanwhile, far beneath the high country, Darlene Fields ( Joe's wife ) was stuck in an ever growing line of traffic backed up on U.S. 23 outside of Norton. She was sitting right on the large bridge near Little Stone Mountain Gap, in the Head of Powell Valley, and making little to no progress. backed up all the way to Big Stone Gap! Darlene was one of the blessed! 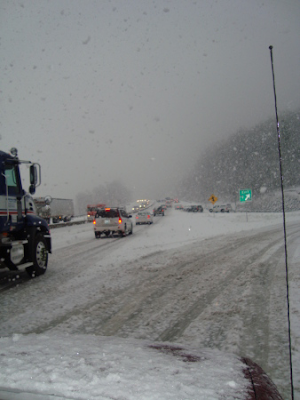 Some people spent MUCH longer on the snarled roadway, up to 9+ hours, while many others simply gave up and abandoned their vehicles! 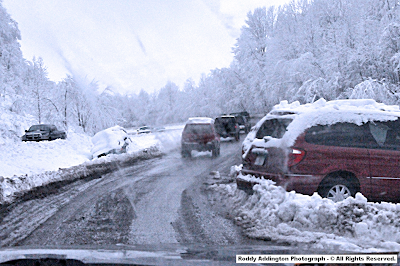 Photographer Roddy Addington captured some of these chaotic scenes through his truck windshield during a drive along U.S. 23 the following day. 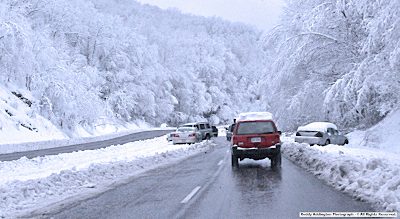 The problem, at least partly, was a truly dramatic weather change from only rain in Big Stone Gap to heavy, wet snow across the Head of Powell Valley and northern-northwest slopes of the High Knob Massif, such that travelers along U.S. 23 were experiencing a rapid change and deterioration in driving conditions. Travel along old Route 23-Alt. 58 through the "Big Stone Gap" in the northwestern arm of the High Knob Massif offered little relief, as another dramatic transition zone was encountered upon passing through the water gap to the northwestern slopes of Little Stone Mountain ( going from rain to very heavy snow ). 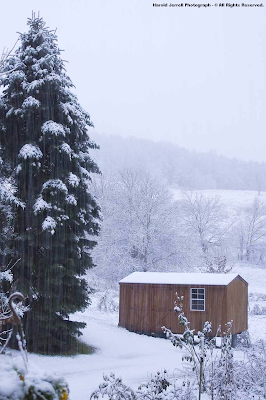 Roddy Addington confirmed the above, as was previously noted, with just rain at his construction site in the Cracker Neck of Powell Valley through 1500 hours ( around the time he left for his home in Pound and encountered the HUGE snowflakes near Little Stone Mountain Gap ). But the storm was only starting to CRANK during the 1500-1700 hour period, with the most INTENSE portion yet to come! 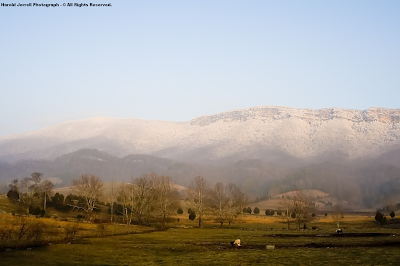 Since the High Knob Massif is the BIG DOG ( largest mountain mass ) across southwestern Virginia, it often dominates and controls the precipitation pattern. This could easily be seen on Doppler radar. [ A series of illustrated Doppler radar images will highlight this section, as personal stories and conditions are told to document this incredible time ]. The 1700-2000 hour ( 5-8 PM ) period on December 18 was dominated by EXTREME snowfall rates, and the notable formation and reformation of higher reflectivity echoes along the W-WNW flanks of the High Knob high country. 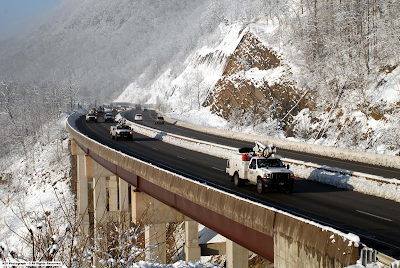 All major mountain passes in the High Knob Massif area were essentially shut-down early by this storm, which was also the case farther north along U.S. 23 on Wise Mountain ( Indian Gap ) and Pine Mountain ( Pound Gap ) and on U.S. 119 across Pine Mountain between Whitesburg and Cumberland in Kentucky. ( between Jenkins, Ky., and Pound, Va. ). Sandra said it took them one LONG hour to get down the Virginia side of the mountain, where they ended up staying the night at the Valero Gas Station near Pound. Electricity went off around midnight, leaving them in darkness! Sandra and Freda were actually fortunate, as a while later conditions became so bad that no one could travel by vehicle, either up or down, on the Virginia side of the mountain. A young man working in Kentucky told me that he only made it to Pound Gap, where he left his 4-wheel drive truck and walked 8 long hours to get down to his home in Pound ( he could have froze to death if conditions had not been relatively mild ). Along the way he saw tractor trailer trucks overturned, a sporty Mustang stuck beneath a big rig, vehicles getting stuck trying to go up the wrong side of U.S. 23, and so much falling snow that it was hard to see ( let alone walk ). It was complete and total chaos! Such was also the situation along U.S. 119 which crosses Pine Mountain just southwest of Flat Gap, and in the Indian Gap of U.S. 23 just outside the town of Wise. 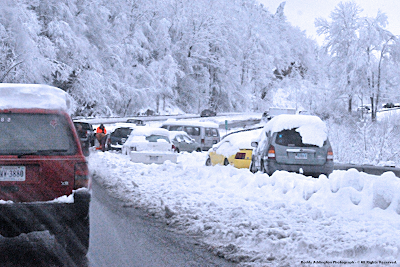 The U.S. 119 site was frightening for many parents since a couple of school buses became stuck on the mountain ( with a rush of folks trying to rescue them adding to the panic and chaos ). of highest reflectivities along the rugged Wise-Scott border, where formation and reformation occurred, with simply AWESOME snowfall rates per hour in the Thunderstruck Knob to Eagle Knob corridor of the High Knob high country. My cousin Meghan Mullins got stranded in that Indian Gap mess, and luckily had a cell phone to call her step father for help. Carroll Wayne McCoy left the Georges Fork section of Dickenson County to pick up Meghan, with chain saw in back of truck, and would not return home with her for 7.5 hours ( typically it would have taken less than 1-hour ). The only way home was via State Route 72, from Coeburn to Clintwood, and then it was only possible by using a chain saw to cut falling trees out of the road. One tree, however, fell and busted his truck windshield. What a truly dangerous experience! 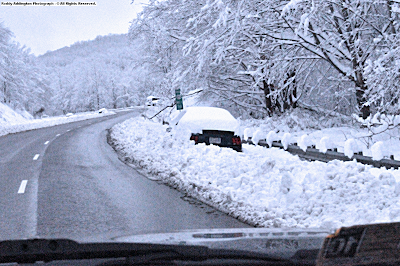 Like in January 1998, but even worse, abandoned vehicles became so numerous along highways across Wise and Dickenson counties that VDOT crews could not even work the roadways. Of course, the real problem became falling trees and power lines! Darlene Fields called husband Joe to come pick her up, after the long Friday evening journey into Norton from the Head of Powell Valley. Joe could not reach her along Alt. 58, from Tacoma, and had to take back roads to finally get to the Hardee's in Norton where Darlene was waiting. ( December 20 ) ]. 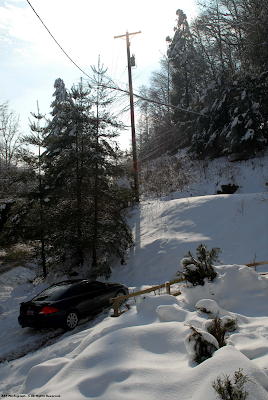 Getting home was not easy, with Joe having an accident when his 4x4 truck slid off the road into an embankment. It had to be left behind, with Darlene following in another 4x4 to pick him up. Of course, upon returning, they had no electricity, phone, or water, and their typically trusty generator would not start. and beginning of a rough week! No main or secondary road, and hardly even a single street or driveway, were passable from the High Knob Massif northward across Wise County, Dickenson County, and Buchanan County. 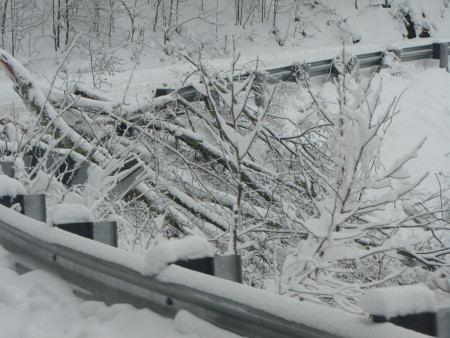 Roads were blocked by abandoned vehicles in deep snow, power lines and poles, and in some hollows by more than 70 uprooted and fallen trees along single stretches! People were simply isolated and trapped in place, where ever that may have been at the time, and I DO MEAN ISOLATED. It literally took many DAYS in some cases to open the worse roads via a collective effort of local residents, VDOT, AEP, and other workers. ( how 4 percent kept power I am yet to figure out ). In addition, most folks also lost phone, cable, internet, and water. It was indeed the start of a very rough period for many residents. No one, including news media, outside the local area realized the significance of this storm event and the hardships faced by local residents. For the young and strong it was manageable, but for older residents, those sick, and those alone and isolated it was a tough, scary, and very dangerous time in their lives. It simply became day to day survival. The evening of December 18 and overnight period of December 19 was a truly HORRID experience for many folks in their homes. Many simply could not sleep for fear of being killed in bed! deep, HEAVY ( high density ) snowfall. The entire horizon above Clintwood lit up with an eerie pinkish glow as trees ripped away power lines from transformers & flashed through falling snow crystals. A scene not seen since, you guessed it, the great January 1998 blitz! adjacent to our home ]. Anyone not living in a wooded area, or never going through a storm event like this, simply can not truly understand what I have just stated. That is what was perhaps most upsetting to me during this event. The knowing that people would be isolated, lucky to survive the night without injury, and faced with a simply enormous recovery effort which would take a VERY long time. trees and limbs. It was complete isolation! Weather charts by early on December 19 revealed that the cyclone had taken a simply CLASSIC Miller A storm track ( please reference early portion of chronicle ). 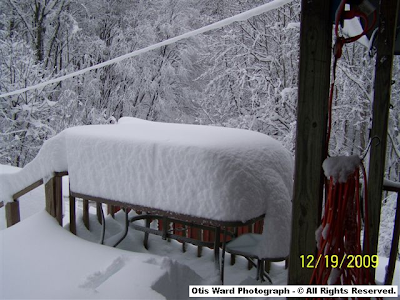 A snow depth of 24" was measured by Otis & Nancy Ward during the morning of December 19, at their home in the Robinson Knob community of the highcountry ( elevation 3235 feet ). [ I will highlight an entire series of pictures taken by my friends Otis & Nancy Ward within this section. More snow fell after these pictures were taken! ]. 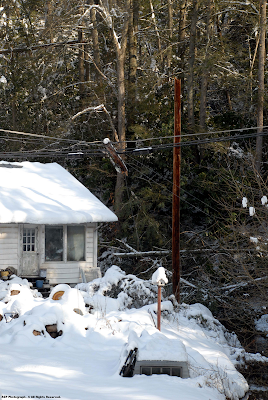 Otis & Nancy had no electricity, phone, or public water and remained without power for 6 days and nights. 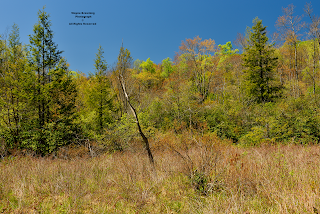 However, living in the High Knob highcountry since April 1974, they had been through such periods many times before. 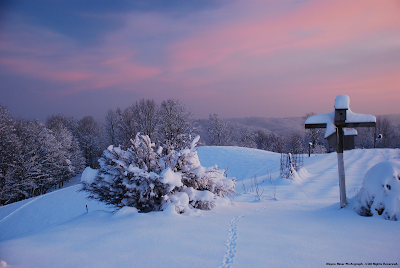 Johnny Combs also reported deep snow at his home in the Flat Gap of the High Knob Massif, located 1.8 air miles northeast of Robinson Knob. Johnny said the snow was "well above my knees," and reported significant damage to trees around and below his elevation of 2750 feet. 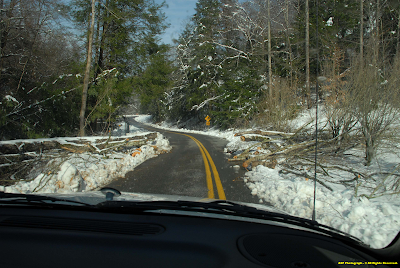 ( State Route 699 ) up to Flat Gap, with one large tree falling before Johnny could get back home during the evening of December 18. He had to walk home through the heavy snowfall to get his chain saw. A couple of 4x4 trucks had gotten stuck trying to cross the trees in the deepening snow and made the situation more complicated. Chris Sturgill rode a 4-wheeler up the mountain from his father's home in Coeburn and was also blocked by the big tree until Johnny was able to cut it out. Chris was heading to his home within the East Moore Knob section of the High Knob highcountry ( elevation around 3200 feet ). The snow accumulated so much that Chris eventually had to abandon his ride and walk the final mile through DEEP & drifting snow to reach his family. 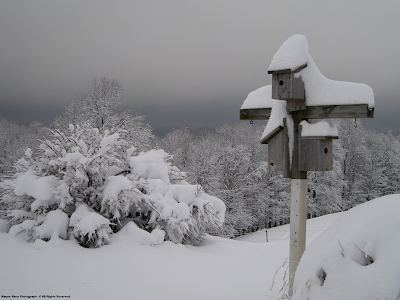 The deepest snow actually accumulated 4 to 10 air miles to the west and southwest of Robinson Knob, within the main crest zone of the High Knob Massif between Thunderstruck Knob and Eagle Knob, Camp Rock, and the upper Big Cherry Basin. [ The section of the massif impacted most by its orographically generated and anchored thermally indirect circulation ]. 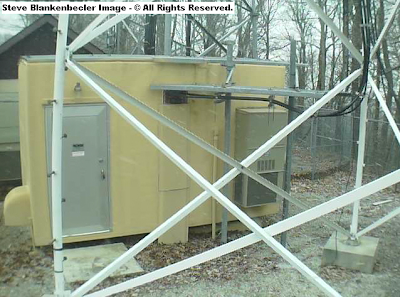 My friend Steve Blankenbecler, of VA-KY Communications, verified the DEEP snow during a trip to the Eagle Knob tower site on December 21. 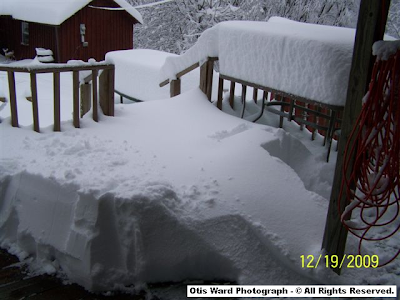 Steve reported snow depths of around 3 feet, with drifts of 4-5 feet. This after some settlement on the snowpack during the previous 48-72 hours via sheer weight of upper portions of the big snow pressing downward on the first foot or so next to the ground. Wow! Cal Adams measured 34" of snow depth at his home in the upper Devil Fork Basin, adjacent to Big Cherry Lake, on the morning of December 19. 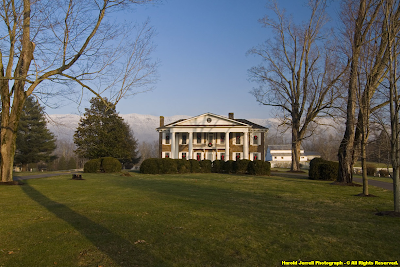 Cal's home is located on Little Mountain of the High Knob Massif, SW of Straight Fork Ridge. The snow depth was not a drift, since Cal measured it in three different places and it was all "straddle" deep and up to his truck bed! Cal measured local depths up to 42" . This was an important report given Cal's home is significantly lower in elevation than the head of majestic Big Cherry Basin and the adjacent Eagle Knob summit to indicate that a massive dump of snow had buried the crest zone for miles! 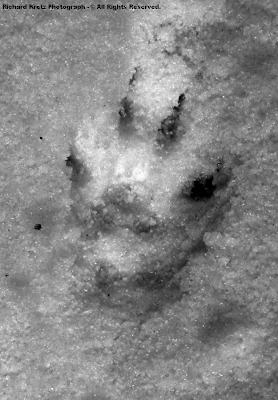 [ Cal reported that his Beagle dog was like a mole in the deep snow, as it would completely disappear and tunnel through it ]. A dozer was eventually brought in to open up the road into Little Mountain, and the Eagle Knob communications area ( shown above ), where electrical engineer Terry Surface had to haul in extra diesel fuel to keep the generator going for Blue Ridge Public Television ( WSBN-TV ). An Old Dominion Power worker confirmed the deep depths within the Big Cherry Lake area, where he said it was "over his knees." The snow, which was between knee and waist deep, had actually settled quite a bit by that point as well. 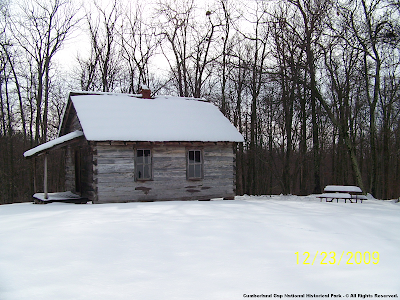 Robinson Knob of High Knob Massif - Snow depth of 24"
David Sturgill confirmed these reports upon a visit to his cabin located at the northeastern end of what was once known as Johnson's Pasture on Little Mountain. 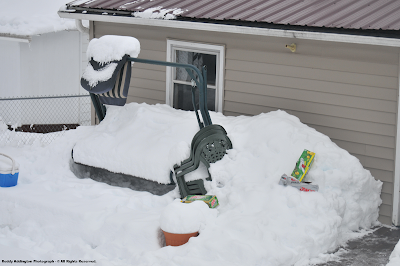 His wife Ann reported that David found snow depths more than 2 feet deep, with 4-5 foot drifts, some 5 days after the storm event. The snow was still deep enough to stick his 4x4 truck. My friend Gary Hampton, Superintendent of the Big Stone Gap Water Plant sitting within the mouth of South Fork Gorge of the High Knob Massif, indirectly verified these HUGE snowfall reports with a 2.85" rain gage water content on his 4"-diameter NWS gage ( elevation 1915 feet ). The rain gage location sits 2308 vertical feet lower in elevation than the High Knob peak ( and head of Big Cherry Basin ). The significance of the 2.85" rain gauge total in the mouth of South Fork Gorge of High Knob is that it all fell as snow up above the Plant, where water contents were likely well over 3.00" and the density of snow lower ( please reference my later snowfall density discussion ). 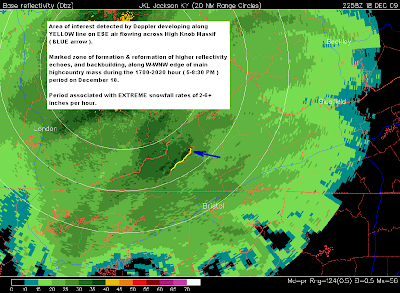 It was also 1.12" more than the NWS rain gage measurement at the Big Stone Gap Wastewater Treatment Plant, located 6.0 air miles to the west, on the sinking side of the orographically created and anchored circulation ( measurement made with an official 8"-diameter NWS gauge ). Jim Davis reported that the Big Stone Gap WWTP total included mostly rain, with only around 2" of total snow depth along the Powell River ( near the Wise-Lee border ). 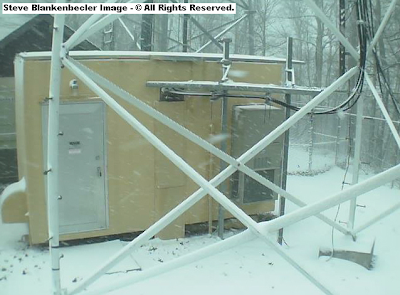 Frank Gentry verified this report and said he did not lose electricity, kept phone service, and had only around 2" of snow depth at his home not far from the Big Stone Gap WWTP. 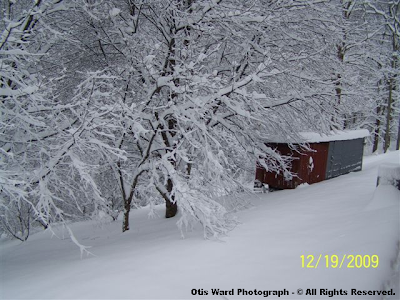 My friends Otis & Nancy Ward measured 3.27" during the December 14-24 period, which included some December 14-15 rainfall. This was prior to 0.85" of additional rainfall measured into Christmas day. 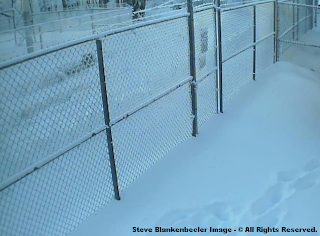 MUCH moisture was lost by the 4"-diameter NWS gage in the big snow since it could only hold around half the 2 feet of depth ( assuming perfect catch, which was NOT realistic given winds during this event in upper elevations above 3000 feet ). So while the 10.20" Robinson Knob total for December 1-25 is impressive, it is very likely more than 1.00" below what actually accumulated during that period. 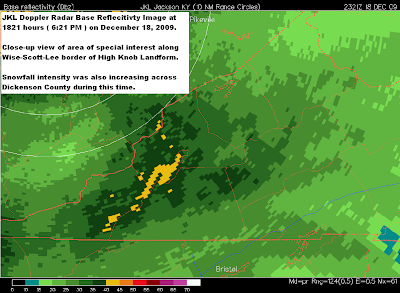 Wetter portions of the High Knob Massif had at least 11.00" to 12.00"+ of total precipitation during December 2009 ( with additional rain & snow being measured at month's end ). in only a relatively short distance of 5-10+ air miles on the morning of December 19. Most impressive of all, however, is the fact that much of this HUGE depth of snow accumulated between NOON and MIDNIGHT on December 18 via simply AMAZING snowfall rates! ( in Shenandoah National Park ). 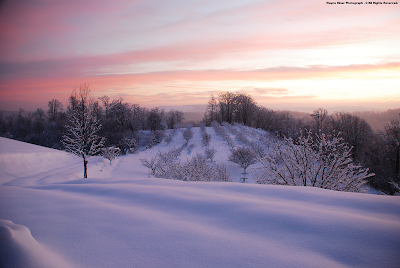 The 36" to 40"+ of snow depth which accumulated within the High Knob Massif during the January 1998 storm also broke the state 24-hour snowfall record ( unofficially ). It is most interesting to note that both of these great MEGA-dump events were associated with an orographically forced and anchored Thermally Indirect Mesoscale Circulation on easterly air flow trajectories crossing the High Knob highcountry. 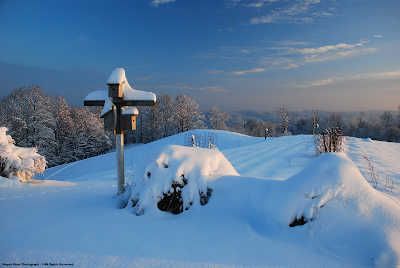 Of the 46" of snow hand-measured by Joe & Darlene Fields within High Chaparral of High Knob during the great blizzard of March 1993, 30" were measured within 24-hours at 3300 feet elevation. That implied the 24-hour state snowfall record was again broken above 3300 feet, where final snow depths reached 58" near the 4223 foot summit level. That occurred without development of the Thermally Indirect Mesoscale Circulation noted during the January 1998 and December 2009 events. All of these above reports have been verified by MULTIPLE individuals during each storm episode noted, with March 1993 & December 2009 events being especially well documented. 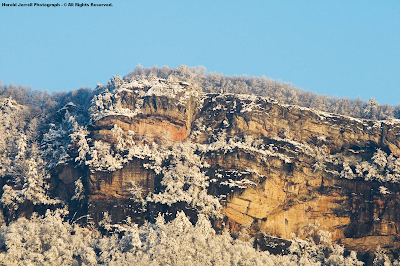 Mark Quillin illustrated the nature of conditions found early on December 19 as he worked hard to get into Appalachia Lake WP on Little Stone Mountain of the High Knob Massif. Mark, who lives amid the Head of Powell Valley, had a journey just getting out of the Valley. After a night spent amid constant pops, cracks, and crashes, with even a few trees rolling down the steep mountain slope above his home, he headed south through the Valley with numerous trees across the road ( he had a chain saw, which would soon get plenty more use! ). [ A significant snowfall gradient developed within Powell Valley itself, from the noted 2" of depth near the Powell River in Big Stone Gap to a foot or more of depth in the Valley Head. The entire Valley had a significant amount of rain, with air flow downslope off the massif, prior to the change into WET snow ]. Once reaching the base of Little Stone Mountain in Appalachia, Mark had NO CHOICE but to walk with chain saw. It took him nearly 8 hours to walk up the mountain, cutting trees out of the road as he went to reach the Water Plant ( Appalachia Lake WP sits at 2360 feet, 1024 vertical feet lower than the summit which rises above the Lake ). Walking is NOT the proper word. This snow was like trying to MOVE IN CEMENT, making even getting around on FLAT ground ( rare in this area ) difficult. Snow depths were knee deep in places, with 16" to 22" of general snow depth around and below Appalachia Lake. Like most everywhere electricity was OUT and the Water Plant had to be run off generator power via much hard work by Superintendent Jack Pitts and Mark. 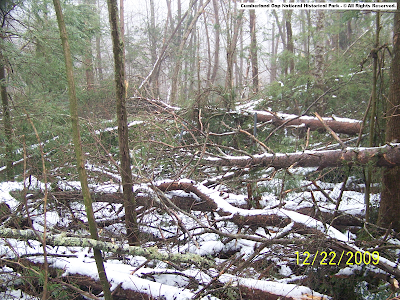 Although snow had stopped falling heavily before dawn on December 19, what most everyone outside of this GROUND ZERO impact zone did not realize was that trees continued to fall. 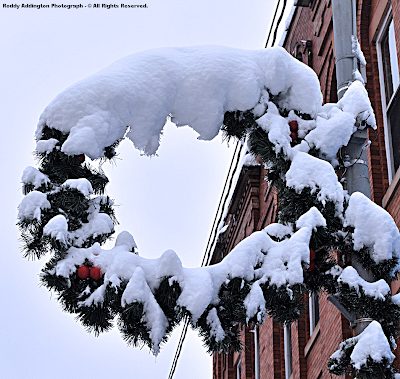 The dense snow continued to lay upon trees, bringing more and more down through daylight hours of December 19 into the next day! POPS, CRACKS, and even a few THUNDEROUS CRASHES could be heard for SEVERAL DAYS after the real storm ended. Mark returned to the Little Stone Mountain base with a 4-Wheeler early on December 20, thinking he would be able to just ride up to the Water Plant. NO WAY!! He had to cut some 30 more trees out of his way, making more than 50 trees cut along this single section of roadway. Many of the trees were large, since they fell over from their roots. Some trees uprooted and fell over against standing trees ( as many remain RIGHT NOW ), while MANY limbs were stripped and left bent down or hanging in other standing trees. 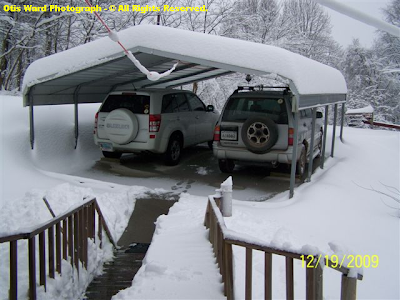 Mark's story exemplifies the severe conditions endured from the High Knob Massif northward across Wise and Dickenson counties. Another aspect of this initial post-storm period was low clouds that obscured higher elevations, continued light snow, and absolutely NOT a single PEEP of any sunshine for 3 days. 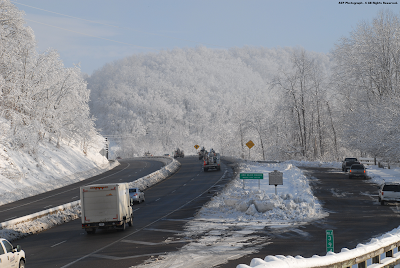 for DAYS after the storm, with Roddy Addington illustrating more scenes along U.S. 23 between Norton and Big Stone Gap. VDOT did an exceptional job working through this disaster, with my friend Harmon Kilgore noting that it was the most difficult situation he had ever experienced ( VDOT in Wise & Dickenson counties are NO rookies when it comes to winter ). For many living away from MAIN interstates, like U.S. 23, it was either easier or just plain necessary to WALK during and after this storm! Finding a place to put all the snow was simple, just pile it up against the house to hold in some HEAT with NO electricity for MILES around in the vast majority of locations! At the Browning Home we had GREAT SLABS of snow that gradually slid down off the roof, but would not break loose until they nearly blocked the entire view from the windows. Then, with a force that would literally shake the ground, BOOM, a slab would drop by day or night into a massive pile. 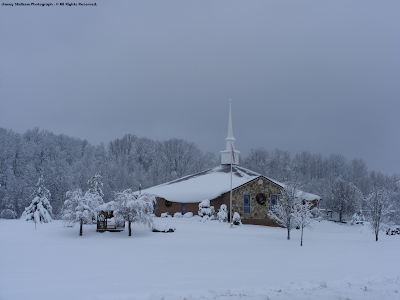 This is illustrated below by a Jimmy Stidham photograph, taken of Lighthouse Church in Wise. Photograph by Jimmy Stidham - © All Rights Reserved. Jimmy Stidham measured 14" of snow depth on Stephens Road in Wise, with 14" also measured by his pastor at Lighthouse Church in Wise ( shown above on Lake Street ). Local snow depths as great as 22" were reported on Dale Branch Road, in the Hurricane section of the Wise Plateau. 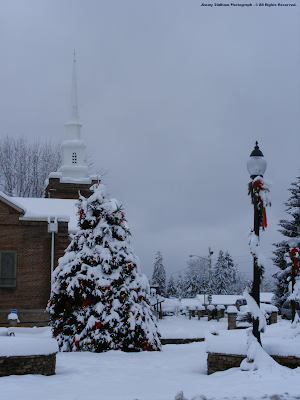 For many thousands in Wise and Dickenson counties, as well as northern Scott and Buchanan, it would be a Christmas spent in darkness. Another day to survive, warmed only by the love of family and friends and the knowing that we were still alive! Sending out Christmas Cards, getting presents, and decorating the home all became pushed WAY back on the list of daily chores. Life was different now. MUCH different. In important ways it brought back what was truly most precious! 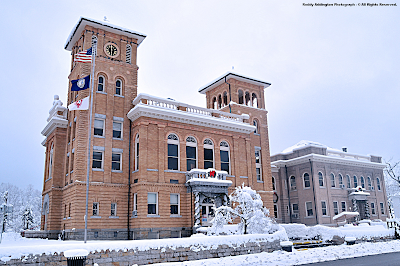 The renovated Wise Courthouse stood stately amid the DEEP snow in downtown Wise ( officially, the snowiest town in Virginia ). 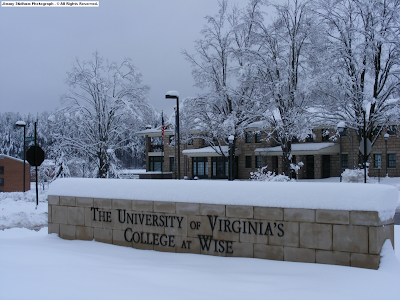 This great MEGA-disaster snowstorm came a week or so too late to disrupt examinations & final grades at UVA in Wise, but it made the entrance look nice! 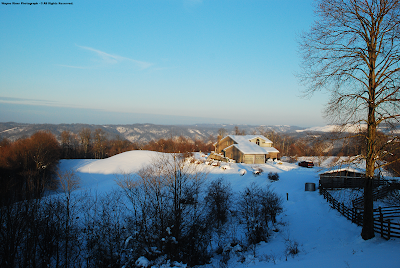 Mountain farms along the lofty Guest Mountain portion of the Tennessee Valley Divide, near the town of Wise, looked picturesque with deep snow set against the darkness of a mid-December sky! Once sunshine FINALLY returned it was a very WELCOMED and most gorgeous sight across the highlands!! No one could deny the beauty of this snowfall, despite its great destructive wrath, with time taken to ponder how Mother Nature RULES even amid this MODERN age! In many homes without electricity, cable, internet, satellite, or any other modern convenience, nights were spent listening to battery powered radios. Only glimpses of the "outside" world could be caught at times, with regional and national news being limited by poor signals filled with static, jiggling the radio dial and antenna to try and occasionally pick up a better reception ( signals amid deep mountain hollows are not like ones clearly received upon mountain ridges, or within large, open valleys ). [ Batteries became as "scarce as hens teeth," as my Grandpa used to say, and hardly could be found anywhere. Ditto for candles, lamp oil, and the other common necessities of such living. Some traveled all the way to the Tri-Cities, in northeastern Tennessee, or northward to Pikeville, Ky., in order to find supplies ]. A great deal of low-level moisture lingered in the wake of this incredible event, even after sun returned to shine upon the snowy landscape. This was just beautifully illustated in an American Electric Power ( AEP ) photograph as workers poured into this devastated area from far away, no doubt amazed by awesome beauty of the High Knob highcountry spreading outward from Powell Valley. AEP Photograph - © All Rights Reserved. Workers heading north into GROUND ZERO! often incredible diversity of its climate! As all of the above is pondered, and much more presented below, it is hard and simply unreal to discover that southwestern parts of the HKL, downstream of the remnant massif of its lofty highcountry on E-NE winds, had increasingly limited impacts from a winter storm of such great fury and destruction! In the Cumberland Gap National Historical Park section this was partly due to downsloping across the lofty backbone of its highlands into Virginia, on NE low-level winds, which greatly reduced snow amounts on valley floors in southwestern parts of Lee County. [ Some significant damage was produced by the storm across mid-upper elevations of the National Park as will be later illustrated ]. 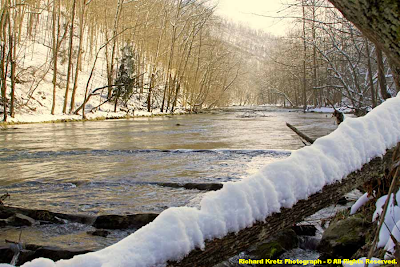 My friend & photographer Harold Jerrell reported that hardly any snow accumulated on valley floors of Lee County, southwest of The Cedars. 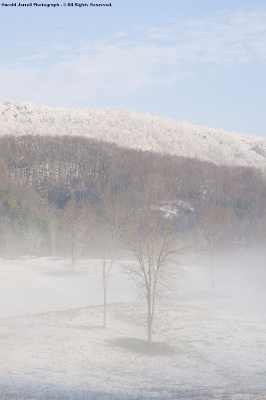 Wilderness Road State Park was a perfect example, with the BLAZING white mass of the Cumberland Mountain arm of the HKL standing like a GREAT WHITE WALL in the background. majestic contrast to its green valley. 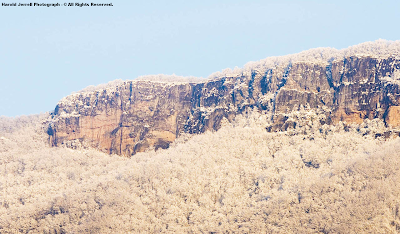 Significant snow and rime extended along the rugged Cumberland Mountain arm ( northwestern flank of the HKL ) until near Rose Hill, southwest of which it became limited on the Virginia side of the mountain. The Rose Hill Cemetery looked as if it was IN A DIFFERENT WORLD on December 22. Although snow limited on the Virginia side, the great White Rocks still dominated the landform above Lee County with a sereal, breathtaking beauty. A bowed orographic wave cloud formed just beyond the White Rocks, mimicking the crestline, to add an interesting feature to this majestic scene. 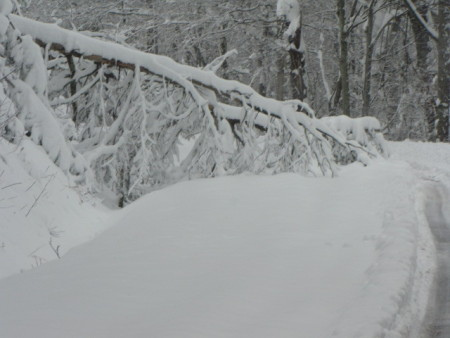 Carol Borneman, Supervisory Interpretive Ranger, of Cumberland Gap National Historical Park reported that they had to close trails and roads within the Park due to fallen trees. Cumberland Gap National Historical Park - © All Rights Reserved. The backbone of the National Park had by far the most snow, where rugged Cumberland and Brush mountains come together to form the lofty highlands of Bailes Meadows and Hensley Flats. Ranger Carol, recent winner of the prestigious Freeman Tilden Award for field interpretation and education within the National Park Service, said storm damage within the Park has initially been estimated at 60,000 dollars. Trees fell across several buildings within the National Park. Harold also had some trees topple on his farm, where rain and sleet turned to heavy, wet snow at his location some 6 miles west of the Flatwoods of Lee County. Although his family only lost electricity for around 30 hours, it was a rough December 18 as his father had to be taken to the hospital after the storm began. 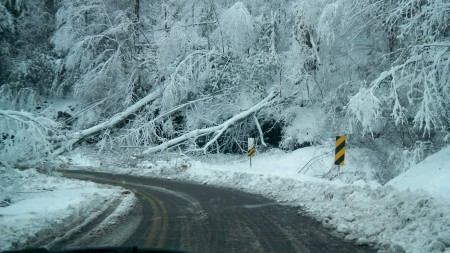 Due to bad conditions it took the rescue squad almost 2 hours to reach Pennington Gap, normally only a 30-minute drive. Now, back to GROUND ZERO! A link to an AEP slide show of photographs is inserted below, while a few other selected images will be shown here. 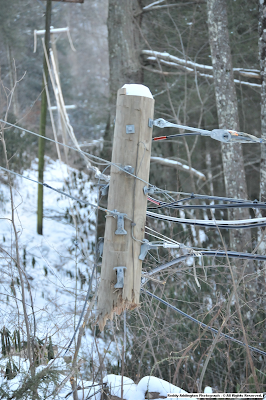 Many HUNDREDS of power poles were broken and damaged in just Dickenson County, with literally MILES of downed lines across Wise, Dickenson, and Buchanan counties. Some locations were left hanging, literally, by localized damage that would leave them sitting in darkness LONG after lights returned to surrounding locales. In most cases, localized damage at homes was only part of a much bigger, widespread array of damage along connecting power lines. This disaster exposed some critical concerns and issues which should be addressed before another one strikes! The following are only a few suggestions. 1 ). All poles need to be GPS marked, so workers not familiar with the area will have an exact and precise way to pinpoint where they need to go. 2 ). The general GRID SYSTEM needs to be made more efficient with respect to routing of power. 3 ). More money needs to be put back into upkeep of the local system, regarding replacement of aging power poles and annual trimming of line corridors. 4 ). All new construction projects need to have electrical lines buried UNDER ground, with a plan put in place to gradually work toward the BURIAL of ALL existing power lines. [ Although certainly of enormous cost, just think how MUCH it would SAVE in the long-term to have all electrical lines buried underground. No snowstorm, ice storm, or wind storm could ever take out power via destruction of trees and breakage of power poles ]. County governments need to adopt a resolution supporting such actions as above, and present it to higher authorities. AEP workers and those contracted to help did extraordinary work, given the magnitude of this disaster, and they are greatly thanked for their efforts. Many had to work under simply brutal conditions, in rugged terrain and life risking situations. PUBLIC outrage in the aftermath of this disaster should be directed at the improvements which NEED to be made, such as those noted above, that clearly rest upon the AEP and ODP corporations ( not those out in the field doing the GRUNT work ). I'm no politician, so BACK to Climatology! It will take some time to study this event in detail, but one fact JUMPS out immediately which clearly shows what made this storm more damaging than January 27-28, 1998. Depth of the ISOTHERMAL Layer! "Worrisome vertical temp profile always can be problematic, with close to 32 degrees from surface up to near High Knob summit ( above which it gets cooler ). So snow density could be high for lower-middle elevations ( increasing danger of power outages and tree damage ), with somewhat lower density snow across upper elevations ( increasing total amounts and drifting up there )." Forecast models were showing a DEEP layer near 32 degrees, which in meteorology is known as an isothermal layer ( vertical temperature profile with nearly the same value ). When that value is near the freezing point, and heavy precip is predicted, you've got some BIG problems at hand. The depth of the isothermal layer ultimately sets SNOW DENSITY bounds, which are simply critical to snowfall impacts. No one should be allowed to forecast winter events without an EXCELLENT understanding of SNOW DENSITY, and its general variations across space and time in the MEAN. 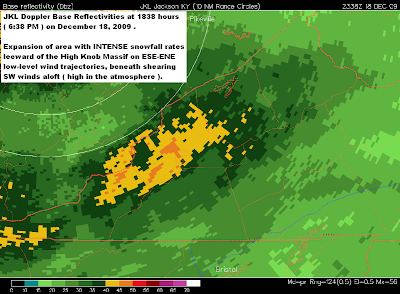 During January 1998 the isothermal layer was relatively shallow, with EXTREMELY HIGH snow densities below 1800-2000 feet in Dickenson County ( as noted previously ). This devastated deep mountain hollows in northern Wise, Dickenson, and Buchanan counties. During December 2009 the isothermal layer was MUCH deeper in the vertical, with HIGH snow densities extending upward into the 2500-3000 foot elevation zone. The size of the area impacted by HIGH to EXTREMELY high snow densities was MUCH larger during the December 2009 storm, with lower-middle elevation zones ( below 3000 feet ) being devastated by WET snowfall in many locations ( exceptions being, as noted below, exposed crestlines where gusty winds helped to blow some of the WET snow off trees ). ( the Russell Fork Basin ) lies below 3000 feet in elevation, as well as nearly all of Buchanan County ( Levisa Fork Basin ), so that a HIGH impact event developed across a large corridor during December 18-19 which extended into adjoining portions of southeast Kentucky and West Virginia. with only a few exceptions into some middle elevation settings ]. Snow density data from the National Weather Service Cooperative Stations in Clintwood, and on Long Ridge of Sandy Ridge, illustrate this well. At Clintwood 1 W, just outside of town, the morning of December 19 found a foot of snow having fallen with 1.92" of melted water content. Since 0.17" of this initially fell as rain, that meant 12.0" of snowfall contained 1.75" of water ( about 0.15" of water per 1.0" of snow ). Snow cores taken at the height of the event, found the SNOW DENSITY reached 6:1, while the mean through December 21 was near 7:1 ( 13.5" of snowfall yielded 1.90" of total water content ). with 0.24" of water content per 1.0" of snow. Such concentrations are common over time, with 0.42" of water content per 1.0" of snow being at one point obtained in the wake of the Jan 1998 event ]. 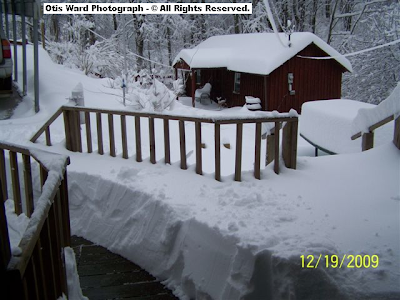 Wayne & Genevie Riner at Nora 4 SSE, on beautiful Long Ridge of Sandy Ridge, got 1.97" of melt water out of 15.5" of snowfall ( 16" ground depth ) into morning hours of December 19. This generated a snow density of about 8:1 at their elevation of 2650 feet above sea level ( 1090 feet higher than Clintwood 1 W ). On the entire event, 17.1" of snowfall generated 2.12" of total melt for a snow density of just over 8:1 ( i.e., 1.00" of water in 8" snow ). However, due to more wind blowing across Long Ridge there was not as much damage as occurred just off the crest ( the gusty wind helping to blow some of the WET snow off trees ). 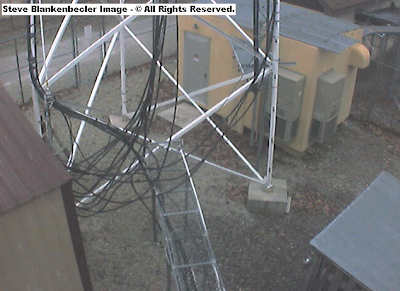 In locations around the elevation of Long Ridge, but not having as much wind, more damage was reported. During January 1998 snow densities lowered above 2000 feet, into the 10:1 to 15:1 range, which translated to a MEGA snow dump and little tree damage across mid-upper elevations. 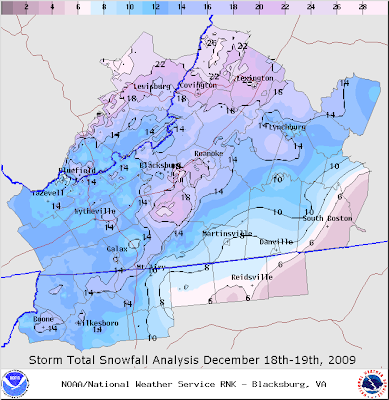 During December 2009 snow densities appear to have lowered into the 10:1 to 12:1 range above 3000 feet, with again a MEGA snow dump across the High Knob highcountry and much less tree damage than within lower elevations. [ Snow densities appeared to lower significantly within the 2500-3000 foot elevation zone of the High Knob Massif, toward the side impacted most by its Thermally Indirect Mesoscale Circulation ]. 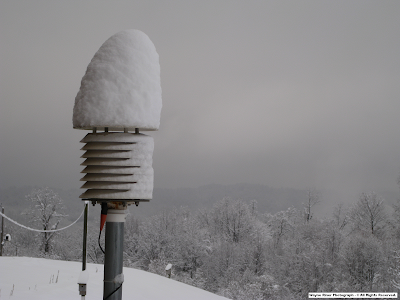 For reference, while snow densities can vary greatly during any given storm at the same location, or between locations, large variations seen in data are often the result of measurement errors or rain gauge undercatches. "regardless of location, latitude, and elevation, most new snow densities fall in the range from 0.04" ( 25:1 ) to 0.10" ( 10:1 ), with peak frequencies centered between 0.06" ( 17:1 ) and 0.09" ( 11:1 )." While that is true in the MEAN, there are notable and important exceptions such as occurred during the great January 1998 and December 2009 storm events. Roddy Addington said a drive upward into the High Knob highcountry during afternoon hours of January 6 was like driving through a great tunnel! 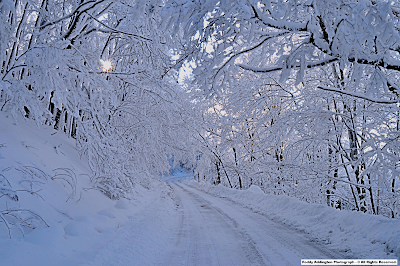 A tunnel of heavily RIME laden trees standing amid a deep and highly varied snowpack. bottom + LOW DENSITY (fluffy) on top! 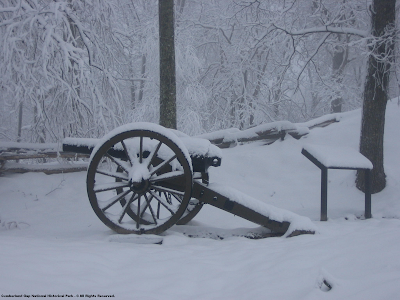 [ NOTE: Conditions in the High Knob Massif are EXTREMELY bad, with only the MAIN roads being opened. NO ONE should drive up there unless absolutely necessary and equipped with 4x4, chains, winter survival gear, cell phone, and notification of destination. The storm coming in during January 7-9 could make travel impossible across the highcountry, with heavy snow, significant drifting, and life-threatening wind chill factors ]. Recent Example: Snowfall received during the January 1-6 period of 2010 has been RADICALLY different in nature from that observed during the Mega-disaster event. It offers another example, at the other end of the snow density spectrum, which departs from the MEAN range noted by Colorado State Climate Lab studies. On Long Ridge at Nora 4 SSE, a total of 10.7" of snow up through 7 AM on January 6 generated a total water content of just 0.28" ( 38:1 density ). That translated to only 0.03" of water per 1.0" of snow. ( FLUFFY, broome sweeping snow )! [ Max densities observed across lower elevations during December 18 contained 0.28" of water in just 1.7" of snowfall ]. Snowfall totals of 12" to 15" have been common in upper elevations of the High Knob Massif during January 1-6, but significant settlement has left much less total FLUFF covering the still DEEP pack of OLD SNOW ( especially across northern slopes ). ( amid the worst or ''best'' places ). in 1.0" of snow ). The good news, one can literally have FEET of very low density snowfall without weighing down trees and causing power outages! 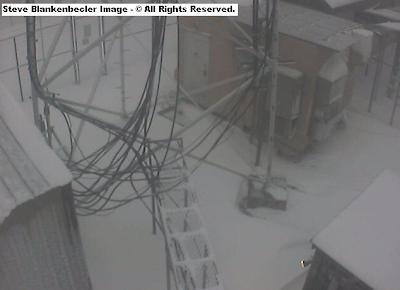 2 to 5 FEET of snow, caused VERY few power outages due to its LOW DENSITY ( high snow to water ratios ). 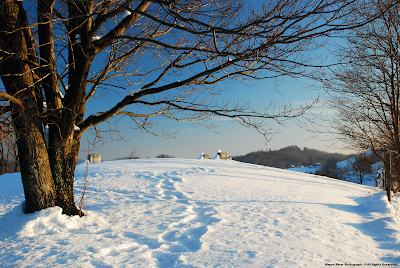 The Bottom Line: Snow Density is EXTREMELY Important! 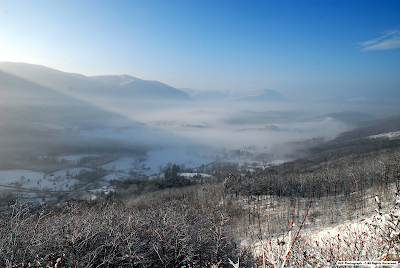 The lower density of snowfall across upper elevations of the High Knob Massif ( above 3000 feet ) during the December 2009 MEGA-dump, like in January 1998, was again testified to by a distinct lack of significant tree damage ( compared to that which occurred across lower-middle elevations of the massif area ). Meanwhile, the greater depth of the isothermal layer below 3000 feet, verses that observed during January 1998, accounted for the MUCH more widespread damage. However, it is a bit more complex, with another important aspect to be considered. The same amount of water equivalent will produce MUCH more snow depth in LOW DENSITY verses HIGH DENSITY snowfall. The above fact accounts for a couple of additional factors, since the overall snow density observed during December 18-19, 2009 was somewhat lower at all elevations vs. January 27-28, 1998. 1 ). Snow depths became greater during December 2009 within the isothermal layer vs. January 1998, resulting in more weight per unit area and MORE SIGNIFICANT damage across a MUCH larger area ( i.e., a MEGA-disaster ). 2 ). Snow depths remained less across upper elevations of the High Knob Massif vs. January 1998; although, they were still the greatest depths reported across the region into morning hours of December 19 and were associated with truly EXTREME RATES of snowfall ( up to 6"+ per hour ). ( more total WET snow = more weight per unit area ). A heavy, wet snow across a much larger portion of the mountain region, impacting a much greater proportion of the population than in 1998. ( NWSFO ) highlighting the distributions. Eastward across Virginia storm total snowfall amounts were very heavy, but generally less to much less than those observed within upper elevations of the High Knob Massif. 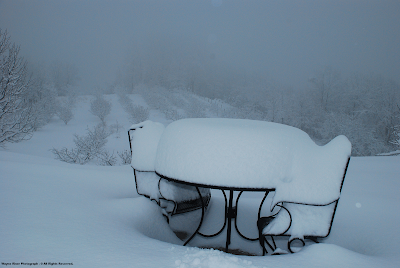 Doug Niemi and Maureen Thompson, of Grayson Highlands State Park, reported 14" to 15" of mean snow depth in the Park. 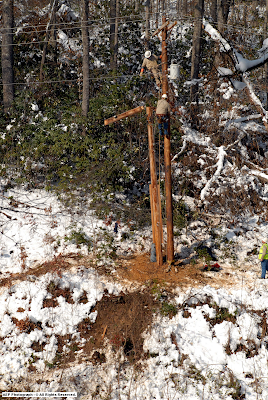 Electricity was out for around 2.5 days, with lots of tree damage due also to a Christmas ice storm ( when power was lost again ) which followed the December 18-19 event along eastern slopes of the Blue Ridge. 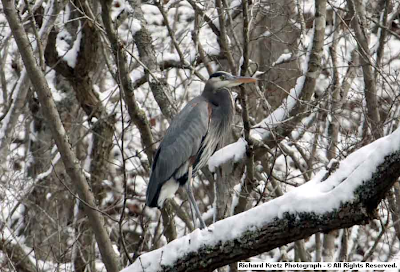 Richard Kretz, photographer & naturalist, shared some nice photographs he took in the Pinnacle Natural Area Preserve ( NAP ) after sunshine returned on December 22, 2009. [ Ecologically rich Pinnacle NAP is located in Russell County, where Big Cedar Creek cuts downward through calcareous stratas to join the magnificent Clinch River ]. 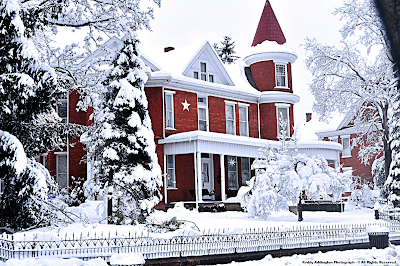 home on Green Valley Road, with a general 4-6" of depth left at majestic Pinnacle NAP on December 22.
at 3300 feet, the official December 18-20 snowfall total was 13.4" ( 1.37" of water equivalent ). 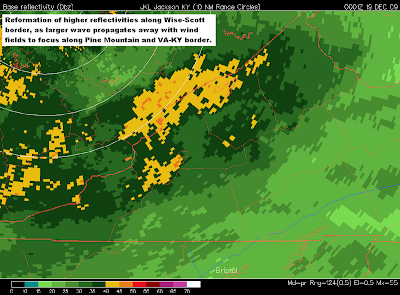 The December 18-20 storm event followed long-term climatology, in generating MUCH less precipitation across the upper Clinch River Basin than within the High Knob Massif. moisture extraction leeward of the High Knob high country only impacted locations to the west and southwest of its massif ( helping reduce snowfall from Big Stone Gap southwestward into Lee County of the HKL ). W-NW sections of the main massif ]. This increased snow depths from 24" in the Robinson Knob and High Chaparral section of the massif to around 36" within the main crest zone, from Eagle Knob and Camp Rock southwest across Little Mountain and the Big Cherry Basin into upper portions of the Stock-Cove Creek basins ( approximate storm snowfall totals of 27" to 38" ). 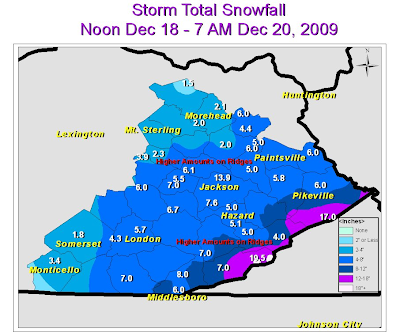 The only other locations that approached these depths in the southern Appalachians were the highest elevations of the Great Smokies, on Mount LeConte, Tn., ( 32" depth ), and the summit level of Mount Mitchell, Nc., ( 28" ), with build-up into December 21 via a continuation of upslope snow showers. Snow densities were generally lower toward the east, where some cold air wedging along eastern flanks of the Blue Ridge supported a cooler vertical column. While damage still occurred during the December 18-19 event, it was MUCH less significant than what occurred within the MEGA-disaster zone chronicled on this website. [ Kenneth Batty, climate historian extraordinaire, of the Charleston, West Virginia NWSFO, taught me years ago that snow DEPTH is what the general public most relates too. Therefore, in this storm chronicle I have focused most upon the depth of snow, especially as it related to observations within upper elevations of the High Knob Massif. 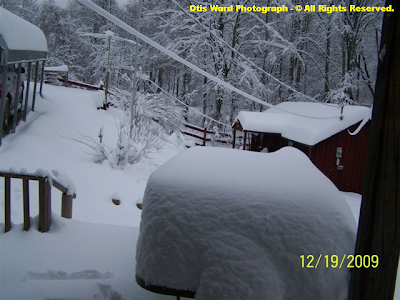 In reality, however, it should be noted that the 24" of snow depth shown in the pictures by my friend Otis Ward, for example, was actually associated with a greater FALL of snow, since such a heavy mass of wet snow will compress and pack down the first inches which accumulated. by "official" methods, of measuring the snow and sweeping it off of a board every 6 hours, the TOTAL FALL would have been greater than the 2 feet seen in the pictures. Snow settles, compresses, sublimates, melts, and blows to alter the DEPTH on the ground over time, such that the official method described ( designed and adopted by Colorado State University Snow Lab Studies ) strives to reduce these factors to yield a more accurate value for the true fall of snow. ( the sometimes called FLUFF factor ). 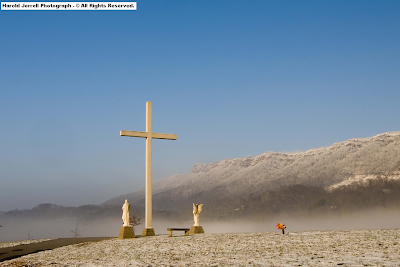 ( sublimation in sub-freezing air and melting in above freezing air enhancing the observed differences )]. as well as the MASSIVE damage it caused. The true impact of the December 18-19, 2009 event may never be fully known, with regard to the stress and strain placed upon our elderly, sick, and those isolated in homes and rural mountain locations for long periods of time. phone service in Wise & Dickenson counties ]. 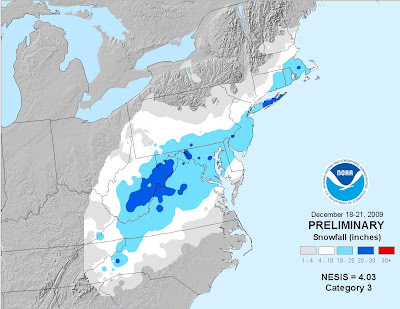 Pre-storm forecasts for counties across far southwestern Virginia placed too little emphasis on snow density, and the possibility of a crippling fall of wet snow with massive power outage potential, given the analog event of January 1998 as a guide. Perhaps no one could have known this event would be so destructive, but upon its unfolding stronger and more aggressive actions needed to be taken immediately by everyone with LIVE communication capabilities. I sent several emails out during the late afternoon of December 18 to news media and the NWSFO to relay how quickly conditions were deteriorating in Wise County, and gave a phone report to the NWSFO, upon their request, for Dickenson County (by that point, however, it was simply becoming frantic here with trees cracking, poping, falling, and communications going out). The remainder of the evening was then spent by candle and flash lights, as I worked to put two 8 foot long 2 x 2 boards together as tree limb shakers. 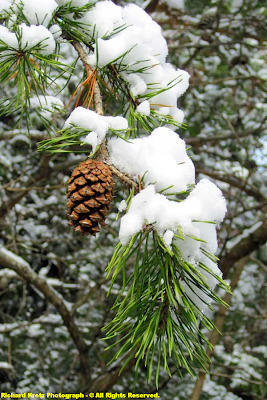 Of special concern was a large white pine in the back yard beneath which sat our generator. I would reach upward as high as possible amid the whiteout of snow to shake limbs vigorously in order to lessen their load. It worked for limbs facing the house, which I could reach, and may have prevented the tree from overturning into the house itself. Otherwise, the snow stripped most of its other limbs, with large piles of broken limbs on each side of the generator by the next morning. The first of MANY jobs ahead was clearing snow and debris to get into the generator (having a generator was not as good as it may sound, as a MAJOR problem with respect to it became one of finding FUEL). I dug a hole into a small stream which runs outward from an isolated mountain hollow behind our home, where no one lives, and used it for filling gallon jugs to flush the toilet. I know my family was blessed since we had made some preparations for a disaster in advance, and had this source of water. The greatest blessing of all for EVERYONE, however, was the fact that this Miller A Cyclone did NOT tap arctic air and pull it across the mountains in its wake! If an air mass like experienced during January 2010 had hit, there would have been MANY deaths (i.e., many more than may ever be either directly or indirectly attributed to this event). It was a MEGA-disaster, which will take a long time to yet recover from, but it could have been worse! [ NOTE: Given all the debris left in the wake of this event, future weather related concerns include high wind settings and high water events ( with MUCH debris along and within creeks ) ]. But Leaves Local Mountains OUT? a 4.03 rating. The minimum rating for a MAJOR winter storm is 4.00 . Most interesting, the NOAA preliminary snowfall map places the High Knob Massif, Wise Plateau, and Tennessee Valley Divide in the same snowfall total range as the Tri-Cities of northeastern Tennessee! [ Note this is snowFALL totals, not snow DEPTHS, with snowfall totals on the entire event being greater than observed depths ]. The only portion of the High Knob Landform that reached into the 10-20" snowfall range was that which covers parts of northeastern Lee County into the Powell River Valley to Big Stone Gap! [ Recall the 2" depth along the Powell River in Big Stone Gap ]. Of course, the REALITY of what happened locally has been completely missed on both the snowfall map and the storm ranking ( and has been on EVERY storm ranked by this system which I have reviewed ). [ The rebuttal would be, this is a REGIONAL scale system that is not designed to depict local conditions which may vary over short distances. That is all very good and well, as long as the locality in question is not named Boston, New York, D.C., or some other large population center! ]. The NESIS System is designed to rank winter storms in a manner somewhat like hurricanes, but clearly is heavily biased toward large population centers that get hit with storms producing snowfall totals of 10" or more. Since this is a small population center, relative to large cities like Washington, D.C., Philly, Boston, and New York, EVERYONE here could be taken out by a winter storm and it would not make a blip on the map if other large regional population centers were NOT impacted. The high snowfall amounts well documented across the High Knob Massif are UNKNOWN to this system. 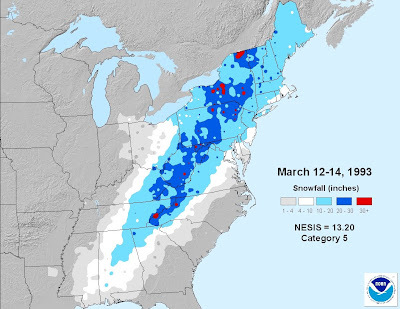 The March 12-14, 1993 Blizzard was a Category 5 ( the highest ranking ) winter storm, due to its impact across such a large region with high total population. While that ranking can indeed be agreed upon by everyone in this region, the 46" to 58" of snowfall and depth across the High Knob Massif ( and 30" to 34" in Clintwood to Wise ) is again unknown to this system, and the above map ( not to mention the 10-25 foot drifts documented by VDOT ). A storm ranking system with good intentions, but CLEARLY biased and lacking for folks like US! [ Some in Wise and Dickenson counties still DO NOT have phone service more than A MONTH after this event ]. 1 ). Hurricanes are ranked according to atmospheric parameters, often BEFORE they impact any human population centers, and without regard to human population centers. 2 ). Winter Storms should also be ranked according to atmospheric parameters, in order to PREVENT the blatant discrimination which arises due to the current population bias. While a winter storm which impacts Boston is clearly more disruptive to the NATION as a whole, in terms of air travel, for example, than one which only strikes the rural Appalachians, we should not as scientists be in the business of establishing rankings based upon human suffering and total population size. For example, millions may suffer from a winter storm in Boston ( or along an elongated corridor ) but who should say that they suffered MORE than folks in rural mountain locations with a population in the tens of thousands, or even less? It might therefore be better to rank Winter Storms like Hurricanes, based solely upon their atmospheric parameters, name them, and then RETIRE those names of the great ones which end up causing massive damage and/or suffering ( after the fact ). [ Only naming the winter storms which meet specific atmospheric criteria, such as minimal hurricane status or greater, and skipping the "tropical storm" naming stage for winter storms ].